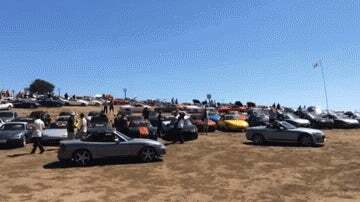 Cars started streaming in around 11am, by the time we arrived it was a zoo, every flavor Miata you've ever seen, spread over a hilltop on just North-West of Mazda Raceway Laguna Seca. A nice fella directing traffic recognized the Million-Mile Miata and pointed us to a prime spot just inside the gate. It was also just adjacent to the siltiest, dustiest road in the joint. Kierstein just washed the thing, but whatever, the Million-Mile Miata is perfectly happy covered in filth. The slow, organized and always polite filtering in of Miatas went on for hours. 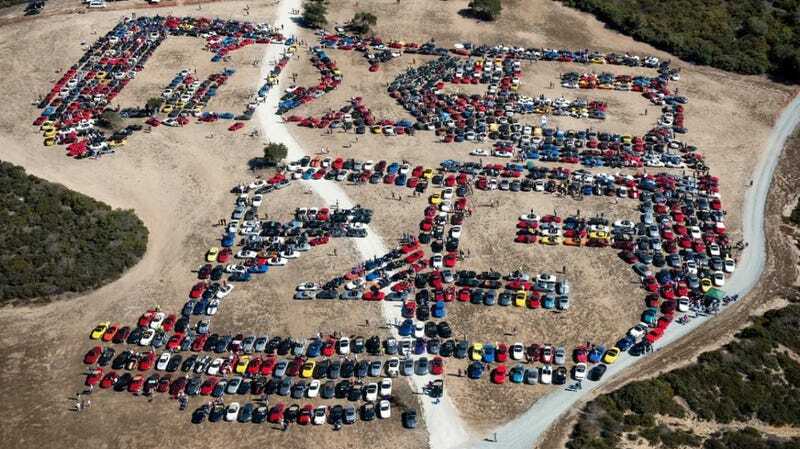 Whole car clubs lined up together, guys from Ohio, lots of Canadians, a t-shirted horde from San Diego, the professional Miata guys from Flyin' Miata, they all arrived early and built the outline. And cars just kept coming. Cars and clubs filed in and built out the side of the X, or bulked up an M, or did their damndest to keep their differentials out of the deep silt at the bottom of the 5. After lunch attention shifted to the access road, the last stragglers snuck into place and the road was shut down for a parade of Miata royalty. The same line that politely stacked up to get in, then happily queued up behind the barbecue, now cheerfully shifted to the street. Bob Hall, Tom Matano, and their progeny, the NA Miata, number 15 ever built were among the first to roll through. For once, Hall and Matano didn't have enough gravity to keep the attention of the crowd. A few cars back, the upstart 2016 MX-5 made its first public appearance and the crowd was caught up in its orbit. Derek Jenkins, Mazda US design boss, and Julien Montousse, the designer responsible for the interior of the ND, quietly and responsibly rolled the car through the crowd. I think they were happy to be there. And so were we. The Million-Mile Miata has been a trooper this weekend. We're driving the little scamp pretty hard these days. It has merrily toted our things and our people all the way across the country without so much as a cough or stutter, and then launched straight into hot laps on a hot day at Mazda Raceway Laguna Seca. The clock is just about to turn over 339,000 miles. What a car. I don't feel a lot of emotion toward my rolling stock. Cars are things. Objects. Good, bad or loved. I'm not in the habit of naming them, or otherwise granting them personhood. But the Million-Mile Miata is different. I care deeply about the little blue thing, and it's been a hell of a lot of fun celebrating its 25th anniversary along with all the other Miata nuts. Inside that circle there, right on the dustiest part of the top of the "M" in "MX-5" you'll see the Million-Mile Miata and the three idiots that have been driving it for the last couple months, Zach Bowman, Alex Kierstein and Yours Truly. Keeping us company you might spot Jalopnik's Travis Okulski (who drove the hell out of the MMM on the track this week) and Mazda designers Derek and Julien hanging out and laughing at our little project. If you were up there on Wolf Hill drop us a line, show us your cherished spot in the family photo, and don't hesitate to say hi if you see us vacuuming all that dust out of the MMM. We'll be looking for sympathetic company.